The harmattan season is a season that brings with it certain ailments, and harsh weather condition. It is a period cold, dry and harsh weather that also brings with dust, caring various germs. November while the dry season is between November and March. sunrise. The season is characterized by cold weather, low humidity, and dust particles suspended in air, blue cloudless sky and drought caused by absence of rainfall. 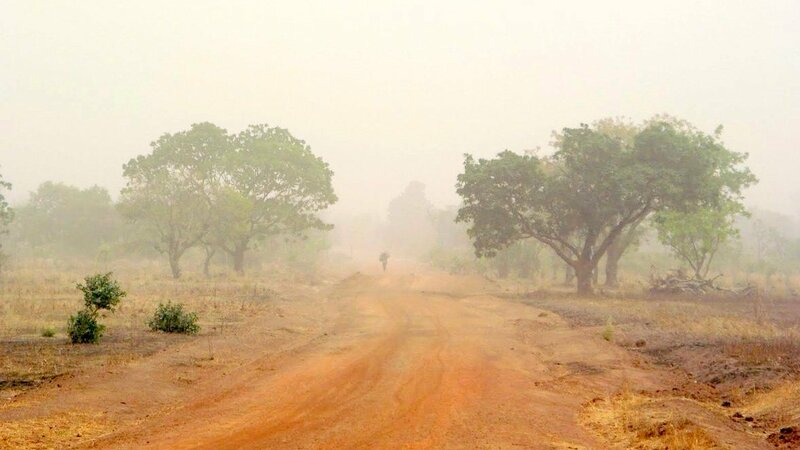 The Harmattan is a seasonal wind which blows across Northwestern Africa every year from November through March, at intermittent strengths. The dry wind lowers the humidity, which can lead to hot days and cool nights. intensify into an actual sandstorm. 1. Fire outbreaks: Fire outbreaks constitute one of the common risks during harmattan. This is as a result of the harmattan, which is associated with dryness and wind. Between November and March, quite a lot of fire outbreaks are often recorded since there is dry wind, which makes it easy for fire to spread at the slightest ignition. 2. Poor Visibility: The harmattan haze with extremely dry dusty wind blows from the Sahara toward the western coast of Africa. This can reduce visibility. Drivers beware! Pilots should also take note that visibility is reduced due to high concentration of dust particles in the air which may sometimes impede air travel. Allergies: Since there will be severe cold mixed with dust, people with asthmatic conditions and any sort of inhalant allergies are advised to take precautions because this is the period when they will be inhaling all sorts of dust. This is the period when the Asthmatic suffers more crises. Many also suffer pneumonia and bronchitis, especially the very young and the aged. Those that are allergic to cold should also endeavor to go for thick clothing that can cover them up. • . The skin: The skin is usually dry with accompanying cracking of the lips, sole of the feet and even the skin itself. The skin can be kept healthy by topical application of oily creams and weather friendly dressing. This is perhaps the best time to explore the cultural advantage of wearing flowing attire and suits. • The eyes: The eyes are directly exposed to the harsh weather especially the dust particles carried by the wind. Thus itching, foreign body sensation and redness may be common especially in individuals with allergic eye disease. Proper eye hygiene in form of washing with clean water, reduced exposure to dust and protective spectacles are advocated. • Sickle cell anaemia: The dry, cold and dusty wind associated with Harmattan also triggers sickle cell crises in affected individuals. Sickle cell anaemia to recall is a genetic disease in which the red blood cells become sickle under a condition of low oxygen tension leading to blockage of small blood vessels. The reduced blood supply to the tissues results in pain especially from the bones. The blood oxygen is usually reduced in extremes of temperatures, cold in this case. ‘Sicklers’ as the patients are often referred to, should be vigilant and keep warm as much as possible to prevent crises. • Food borne diseases: Because of the dusty atmosphere, there is need to imbibe healthy food preservation culture especially food hawkers such as fruits, vegetables etc to prevent food borne diseases. Fruits and vegetables should be properly washed before eating. Our drinking water containers should also be properly covered.
. The epidemic of meningococcal meningitis usually experience between February to May in the ‘meningitis belt’, northern Nigeria inclusive, is an aftermath of Harmattan. • Dehydration: Lots of fluid should be taken to compensate for loss of water from the body into the atmosphere through respiration perspiration and urinating. over time, cough. All these symptoms for just one season! makes for some beautiful sunrises and sunsets. Harmattan period usually comes with dryness and dust because there is little amount of water in the atmosphere(low humidity), this increases the spread of infections or diseases such as dry skin, cold, cough, catarrh, asthma, bronchitis and pneumonia. Cold: is a viral infection of the upper respiratory tract that affects the nose. Coughing, sore throat, runny nose, sneezing and fever are signs of the disease. And you know the weather can be cold during Harmattan, so it is very important to wear appropriate clothing to keep you warm and the cold out. Dry Skin: This condition is very common during Harmattan. You know your skin feels very dry and rough. To prevent this very uncomfortable feelings, avoid using very harsh soaps this period, apply moisturizers frequently on your skin that can protect the skin from dryness and make sure you drink lots of water. Catarrh: This is an unpleasant nasal congestion with a build-up of mucus, usually in the nose, throat, or chest. Ensure you take lots of fruits and vegetables with Viatmin C to help boost your immunity and protect you from these infection. And for those of you who might have already caught it, just take looks of fruits with Vitamin C and inhaling steam from a bowl of hot (but not boiling) water also helps. Cough: This is a reflex action, that helps clear your airways of mucus and irritants such as dust or smoke which aren’t alien to the Harmattan period. To prevent this, you could wear a nose mask when out and about in town. And for those of you who might already have it, just increase your fluid intake. What this does is to keep the mucus thin and helps you cough it up. The Harmattan is a natural phenomenon that we have to contain with . The risk of respiratory irritation is quite high when the weather is too cold and it becomes easy to catch these bacterial or viral infections that cause problems in the lungs, throat, nose or ear. It first starts with trivial illnesses like cold, catarrh and cough. Gradually, it becomes more serious to neuralgia (pain) in the head or torso, toothaches, headaches and sinus; then paralysis of the eyelids, mouth and nerves or cardiac failure. There are so many challenges one could face during this period. They include cracking of lips or cold, dry skin, catarrh, cough and It is important to stay safe and healthy, especially because cold temperatures bring risks. Please look after yourselves and follow these steps to cope better with cold weather. The eyes are exposed to the dust particles carried by the dry, cold and dusty wind leading to itching, redness, and foreign body sensation. Allergic eye diseases are also common. Harmattan also has harmful effects on the respiratory system. This, he added, is because this system communicates directly with the atmosphere. The dust particles may overwhelm the system and predispose it to infection. It is common place to experience excessive sneezing, cough, catarrh and even nasal bleeding. Individuals with pre existing chronic chest infection like asthma should take special precaution to reduce exposure to the dusty atmosphere in addition to having their inhaler with them all the time. You notice that in harmattan season, there is a lot more solids in the air because of the dust, so the air is heavier, more irritating to the nose. The inner of the nose is very soft and delicate just like a blanket and the nose produces this mucus that makes it a lot more comfortable so when there is a lot more dust, that blanket is almost overcome. The nose, in a way to protect itself, of reacts to it, and in some people this is excess. And that is what we call allergy. Allergy is a special disease in which the body tries to fight the alien things coming in. You have the dust, pollen and the hay fever because there is a lot of hay. You know at this time they are making hay when the sun is out and there is a lot of dry grass, that’s the hay. But here, we have a lot of pollen and flowers . So there is a lot of pollen in the air, a lot of grass, the body reacts to it, that over-raection is actually an Immuno Globin E hypersensitive, type one mediated reaction. It can affect the nose, skin, lungs, but that of the nose comes with lots of sneezing and watery discharge .When it is so much, you find some people sneezing a lot and that can also lead to a lot more crust in the nose. Crust is this dry cap that we have inside the nose. Some people tend to pick their nose but they will form again. If you have to go outside, you must dress in warm clothes. Even if you are only making a short journey, be sure to dress in lots of layers. Layers work better than a single thick item because air is trapped in them, thereby keeping you warm. After all, you can also remove layers at your destination. Another way to cope with extreme cold weather, in terms of dressing, is to look after your extremities and exposed areas. Hats, scarves, gloves and appropriate footwear are compulsory. Before you leave your house, ask yourself this question: If I have to hang around, say for a delay in transport, or my car gets caught in traffic, would I stay warm? If the answer is no, you are not dressed appropriately.. The cold weather can be particularly harsh on our skin if we don’t protect it. It makes us to look dull, tired and even older. While it might leave us feeling warmer, it can also dry out the skin. Unless our skin is properly hydrated, it can’t repair itself properly, meaning that every little irritation could become a bigger problem. Heavy wind during cold weather can remove the UV filtering lipids from our skin and accelerate sunburn. This is why it is essential that we make up for the loss of these lipids with creams that block the suns UV rays. Of course, if you don’t protect your skin from the cold, you run the risk of developing skin conditions in later in life. There could be more serious consequences that arise from not protecting your skin, such as cancer of the skin. Keeping a lip balm in your pocket, car and handbag for constant applications will keep chapped, dry lips at bay. Eating hot soup is the best answer to the cold weather. It does not only warm you up, but fills your stomach. Coffee and cocoa are also good at warming you up, but they don’t do quite a good job of filling your stomach. Eating hot food will also ensure that bacteria and virus do not thrive in your belly. Finally, you must not forget to stay hydrated by drinking a lot of water.